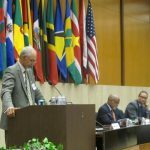 At the request of the U.S. Department of State, the Caribbean Research & Policy Center (CRPC) organized a forum to address the subject of “Security, Development and Governance” in the Caribbean. 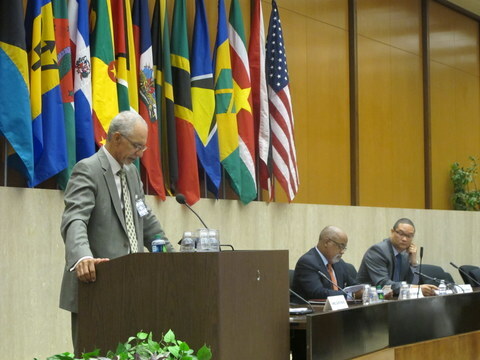 The forum held at the Department of State was a part of its Diplomacy Briefing Series on U.S. Policy in the Caribbean. The audience was a mix of State Department staff and specially invited Caribbean diaspora representatives. Several of the Caribbean participants were drawn from a broad group of Caribbean civic leaders who were also invited to participate in the global diaspora program at the State Department. Members of the Caribbean diplomatic corps were also invited. Ambassador Curtis A. Ward, Chairman, Caribbean Research & Policy Center was the primary presenter. Also making presentations were Dr. Deryck R. Brown, Senior Governance Specialist with the Africa Region of the World Bank, and Mr. Anton Edmunds, CEO of the Edmunds Group International, and former Executive Director of Caribbean-Central American Action. The audience engaged in a lively discussion following the presentations. 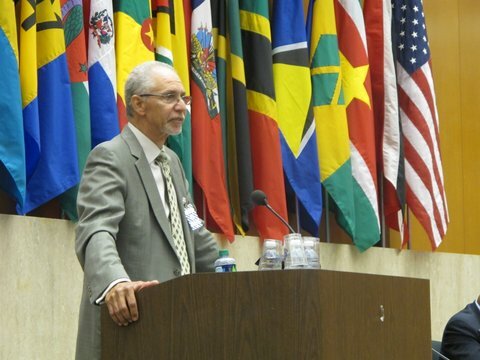 Ambassador Ward’s presentation on the “Security Imperatives for Development and Governance in U.S.–Caribbean Relations,” raised issues of security that are of mutual interests to the United States and the Caribbean. He contrasted the policies of President George W. Bush administration, in particular the limited support from his administration for execution of his “third border initiative” (TBI), and the robust approach of President Barack Obama administration for his Caribbean Basin Security Initiative (CBSI). He warned of the importance of avoiding the failures of the TBI, and to ensure that CBSI and other programs are fully resourced. In noting the nexus between security and development, Ambassador Ward highlighted the importance of a fully informed Caribbean diaspora and its engagement with the Congress to ensure full funding of CBSI and other Caribbean programs. He called on the Department of State to ensure the constant flow of information to the Caribbean diaspora to support policies and programs of mutual interest to the Caribbean and the United States. Mr. Edmunds presentation addressed the importance of U.S.–Caribbean trade to the region’s development and the relevance of U.S. trade facilitation programs. He noted that the region’s development is to the U.S. advantage, as trade between the U.S. and the Caribbean region benefits the U.S. disproportionately. He suggested the U.S. could do more to enhance existing trade facilitation programs. 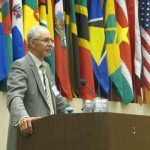 Dr. Brown in addressing the issues of governance in the Caribbean drew attention to the problems of corruption and its erosive effects on good governance. He also pointed to the negative implications for development in the region as a result of the prevalence of corruption.